Nice residents have long feared that attacks like the one happened on Thursday evening would target the resort city, a witness told RT, adding that the French authorities are not doing anything to prevent them, and he fears more to come. “We knew that such [attacks] would happen in Nice. There were rumors that [extremists] may target Nice, or Italy, or Spain,” Antoine Choimar, a cook who works in a restaurant on the Promenade des Anglais and lives in Nice where the tragedy occurred, told RT. Choimar was apparently referring to reports released in spring of 2016 that claimed Islamic State (IS, formerly ISIS/ISIL) was planning attacks at French, Spanish and Italian resorts. He believes that these kinds of attacks will continue to plague France. “Why would they [attacks] stop?” he asked. 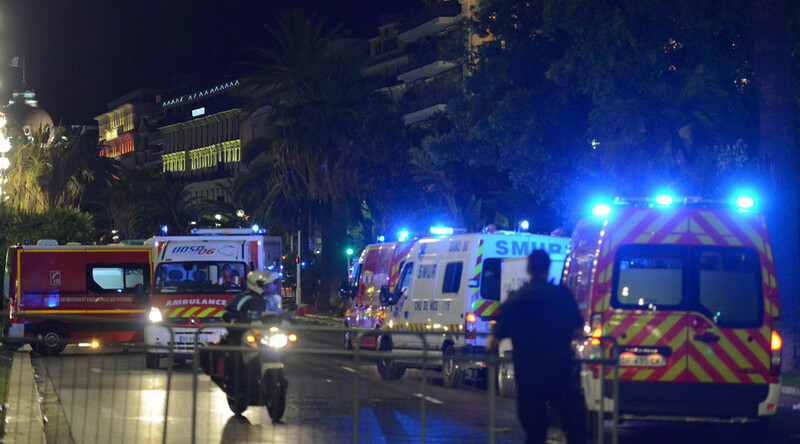 Another witness, a Russian tourist named Alina Shabanova, said she was at a restaurant on the Promenade des Anglais with her husband when the attack occurred. “I heard shouts. I saw people running in all directions. Then I understood that something had happened,” she told RT, adding that her husband saw that truck that plowed into the crowd. Alina and all the diners at the restaurant hid in a storeroom. “In several minutes I saw a young Frenchman whose hands were covered in blood. He was shouting that something had happened on the promenade, and that his wife was there,” she said. “Everyone was crying. There were women with children,” she added. At least 84 people were killed when a truck plowed through a crowd during Bastille Day celebrations in Nice, in what has been called “the worst attack” in the city’s history. Weapons and grenades were found in the vehicle following the attack. The driver, who was killed by police, was a 31-year-old Franco-Tunisian man who was born in Tunisia, a police source close to the investigation told Reuters.